Ilhan Omar has courted controversy ever since she transformed, in the public’s conception, from a telegenic symbol of American pluralism to an actual person with actual opinions. In the months after her swearing-in to Congress, the Minnesota representative has been strident in her criticism of Saudi Arabia and Israel. Both are American allies, but it’s her position on the latter country that has prompted members of her own party to turn against her. 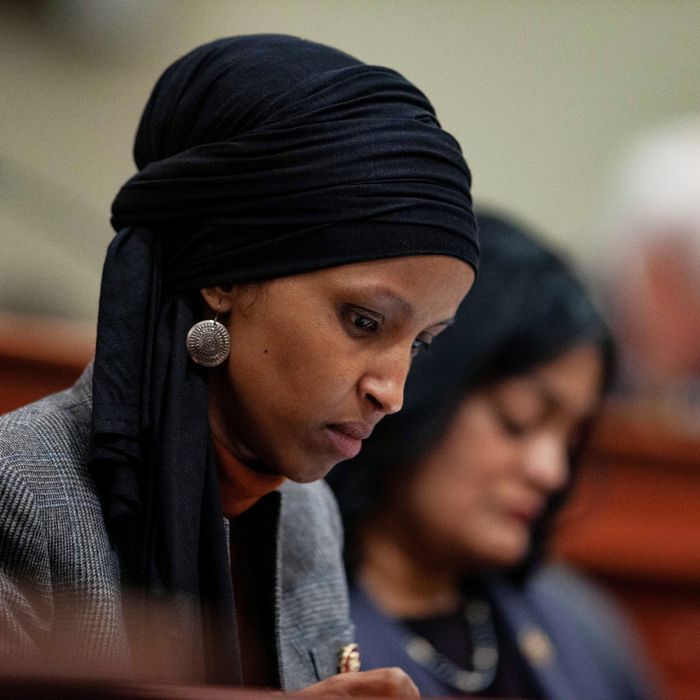 The past two months have seen her accused varyingly of anti-Semitism, disloyalty to the United States, and, most recently, of downplaying the 9/11 terrorist attacks. The first criticism can be attributed to her suggestion that American support for Israel is “all about the Benjamins” — a seeming nod to the bigoted trope that rich Jews control the world. The second and third are more flagrantly Islamophobic in origin. Omar’s imprecision regarding Israel can be frustrating for her supporters. Even those who engage with her geopolitical critiques in good faith might find her deployment — intentional or inadvertent — of anti-Semitic tropes unforgivable, were she not so apologetic about her self-proclaimed ignorance and backed by a vocal cohort of Jewish-American progressives who insist that her comments were directed at a government — not a people — whose supporters routinely accuse its critics of anti-Semitism to stifle debate. But it grows increasingly apparent that efforts to discredit her are rooted in a larger project for which her comments are mere pretext. One of the first two Muslim women ever in Congress was always likely to face smears equating her with terrorism and questioning her loyalty and fitness to serve. Such are the wages of embodying an existential threat to a politics that has spent decades profiting from fear of Muslims, immigrants, and — more recently — refugees and asylum seekers, and vowing ruthlessness toward them in response. Such reductionism is not a recent trend. Congressional “firsts” have long been targeted by political opportunists and bigoted peers, dating back to Reconstruction. Following the Civil War, lies underpinned by stereotypes were how anxieties regarding free black people holding elected office in the South were articulated. “One cannot study Reconstruction without first frankly facing the facts of universal lying,” wrote W.E.B. DuBois in his history of the period, Black Reconstruction. “There was not a single great black leader [of that era] against whom almost unprintable allegations were not repeatedly and definitely made.” Hiram Rhodes Revels, the first black U.S. congressman ever elected, in 1870 faced legal challenges from white Democratic congressmen who claimed he was ineligible because he had not been a citizen long enough, having only been granted said status a few years prior with the 14th Amendment and 1866 Civil Rights Act. (These challenges were later overruled.) Parroting the prejudices of the era, historians and artists attempted to cast Reconstruction as a time when black vice, sloth, and stupidity transformed government into a corrupt and chaotic free-for-all. D.W. Griffith’s 1915 film, Birth of a Nation, famously portrayed black congressmen voting on bills with their boots off, feet on their desks, gorging on fried chicken. This is how power and orthodoxy respond to threats. Neither has encountered a black Muslim congresswoman before, or such a vocal critic of Israeli policy and the lobbying that supports it. Political discourse has reached the point, with Omar, where good-faith debate over her deployment of anti-Semitic tropes has been largely displaced by pure Islamophobic id. Opponents regularly equate her with terrorists, riling up voters, politicians, and pundits who already believe that the proper response to Islam is violence. Trump’s inflammatory rhetoric has already inspired successful and attempted terror attacks — including by Cesar Sayoc, who sent mail bombs to prominent critics of the president, and Robert Bowers, who killed 11 people in a Pittsburgh synagogue after being inspired about a Trump-peddled conspiracy theory about criminal immigrants. But Omar’s treatment is a logical extension of decades of Islamophobic rhetoric and policy — much as the Reconstruction-era response to black congressmen was an extension of centuries of anti-black sentiment and violence. Perhaps it should have been expected in a scenario where Republicans — whose platform and standard-bearer, Trump, call for the exclusion and maltreatment of Muslims, refugees, and asylum seekers — came face-to-face with a Muslim refugee and former asylum seeker from Somalia who is now one of their peers. Political disagreement was bound to define the encounter. But anti-Muslim bigotry is not innate — it is a choice that Omar’s detractors continue to make, and the dangers of doing are only becoming more apparent. Now that Trump has fanned the flames, the backlash only stands to intensify further. The costs are already steep, and they will only get higher.